Airco's DH-4 was Sir Geoffrey DeHavilland's fourth design, and his most successful of the Great War. It was a two seat tactical bomber of all wood construction and featured outstanding performance for the time. It could manoeuvre on an equal footing with fighter aircraft and can be compared to the Mosquito of World War Two for its adaptability and overall usefulness. After the Armistice, the Paris peace conference was the centre for diplomatic efforts watched by the entire world. The British delegation arrived in style (if not exactly luxury) by travelling in specially converted DH-4s which could carry two passengers in a coach style cabin which replaced the gunner's compartment. The RAF's No. 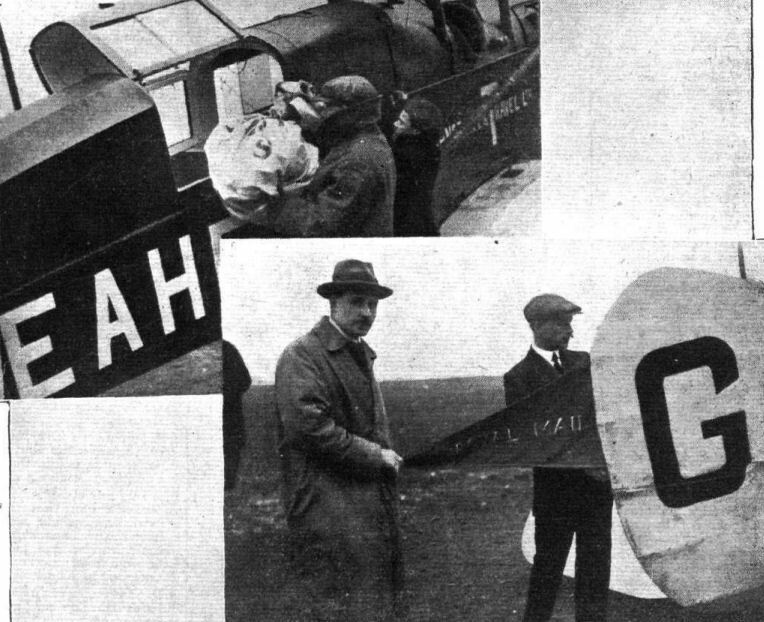 2 Communication Squadron operated these unique aircraft during and after the conference, flying Government Ministers about their business in the immediate aftermath of the War. Seeing the potential for civil operations, airlines were formed to use the design to carry air mail, light freight and passengers. The World's first airline flight carried a reporter from the Evening Standard newspaper, several bundles of the newspaper, a box of Devonshire cream and some grouse from London to Paris on August 25th, 1919. The fate of his luggage is unreported. The box contains a complete wartime DH-4 plus a supplemental sprue with the passenger compartment coupe top and fittings. This guarantees a nice selection of parts to feed the spares box with. There is a moderate amount of flash on the mouldings, but Roden's plastic is soft enough that cleaning it up should not be too much of a difficulty. The exterior fuselage sides show sink marks over all of the interior detail. This appears to be chronic for all releases of this kit. It's not difficult to fill and sand smooth, but it is annoying to have to deal with. The fuselage is two halves from nose to tail with a separate top decking made up of 3 pieces. The cabin windows are open, with clear acetate provided for them. There isn't a great deal of detail to this model, given that the engine is not in evidence. The pilot's cockpit is quite spartan, and the passenger compartment has even less detail. The passenger coupe tops are not designed to be shown open, but it wouldn't take very much effort to open them up. They appear to hinge just above the port windows, and at the centreline. The bottoms of the starboard windows may run in tracks along the fore and aft edges of the cutouts. The wings are each one full span piece with really excellent fabric detail. The undersurfaces sag in a slightly exaggerated manner which would likely tear off if it were suddenly to become real, but which should look convincing on the model. At least the ribs aren't in the dreaded “starving cow” style we had to endure for so many years. The ailerons are moulded as one piece with the wings. The DH-4's rigging is not especially complicated in the abstract, but it is abundant given that it is a two bay aircraft, and the flying wires are doubled. It's going to take some careful planning and jigging to make everything come out neatly. The tailplanes and fin are single pieces, with separate control horns. They could be cut and posed if the builder desires. The elevators are often seen drooped on the ground. The fabric surfaces are nicely portrayed. If the elevators are to be posed drooped, don't forget to pose the joystick and the elevator control bellcranks on the fuselage sides as well. The engine is represented by the tops of the cylinder blocks only, which mostly serve as mounting points for the exhaust pipes. The inside of the engine compartment should likely be painted black or dark grey to prevent the lack of detail from being seen. The landing gear struts and wheels are finely moulded and nicely detailed. The insides of the wheels are separate parts, but the outsides are moulded with the tires. This may cause a trifle of anxiety at painting time. The tailskid disappears to hang unsupported inside the rear fuselage, with only a tiny mounting pin to hold it in place. The enterprising modeller may wish to come up with a re-enforcement to help it stay in place. The decal sheet provides for F5764 of No. 2 Sqn in overall aluminium dope and for G-EAJC on its first passenger flight in blue with aluminium dope flying surfaces. The decals are in Roden's new style, with much more flexible and durable carrier film. They are tough, but do eventually respond to Solvaset. They are glossy, and the printing is in register. The plethora of rigging and multi-part fuselage mean that this kit is not one for beginners, but anyone with a few biplanes under their belt should consider it. The civil option makes this one stand out from its usual drab military contemporaries. G-EAJC with the coupe tops open. A closer view showing details of the coupe top in its open position. The base kit has been released several times by Roden. Highs: A welcome choice of a rare variant. Lows: Sink marks mar the fuselage sides. Fiddly construction. Verdict: Civil subjects are rare enough that anytime one makes an appearance is cause for rejoicing. Nicely done review! One of our missing in action members Lars Qvarfordt (Repainted) posted some comments about this build in the Aeroscale past.